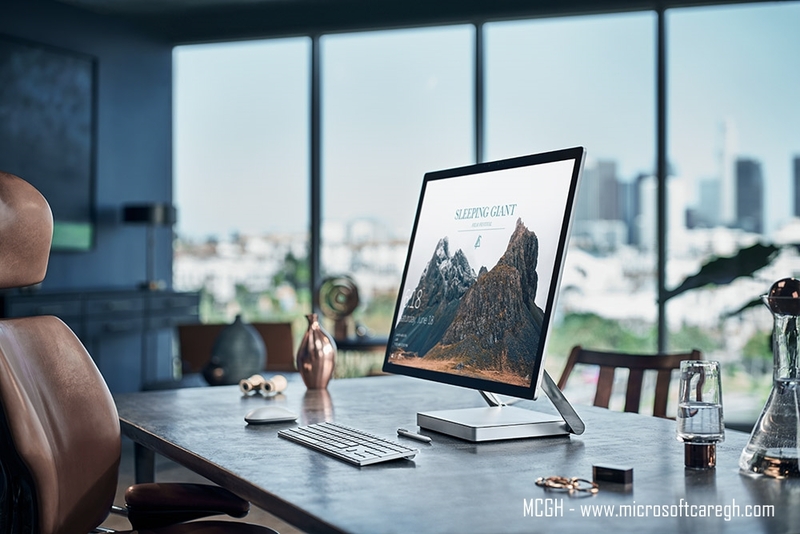 Surface Studio is Microsoft’s All-In-One (AIO) hardware that transforms from a workstation into a powerful digital canvas. The AIO PC is a revolutionary device made for creators and professionals. The device is to spur a new wave of creativity with Microsoft’s upcoming Windows 10 Creators Update. At Microsoft’s October event we witnessed the announcement of a device no one was thinking of. Well not that AIO PC’s are new, but the idea and design of the product we saw, kinda. Before i delve into this just check out the Surface Studio in this video. Microsoft’s Corporate Vice President Devices, Panos Panay introducing the device said we built this device for Creators, to transform how you create and think about creating. Surface Studio comes in a 28″ PixelSense Display with 13.5 million pixels, basically more than 4K. The surface team calls the display pixels true-to-life color. The Display features 192 dpi resolution, 10 point multi-touch at 3:2 aspect ratio. It’s powered by Intel’s 6th Generation Core processors. There a number of variant customizations powering the device ranging up to i7, 4GB NVIDIA GeForce GPU, 32BG RAM and 2TB storage. Available ports on the device are 4 USB 3.0 (one high power port). A Full-size SD card reader (SDXC), compatible Mini DisplayPort. A 3.5 mm headset jack and 1 Gigabit Ethernet port. It also spots a 5.0 MP front camera with 1080p HD video with Windows hello face sign-in. A 802.11ac a/b/g/n for Wi-Fi wireless networking, Bluetooth 4.0 wireless technology and Xbox Wireless built-in. The Surface Studio is Compatible with the Surface Dial for on screen interaction. ” When the screen transitions from Desktop Mode to Studio Mode, it sits at a 20-degree angle, the same angle as a standard drafting board, making it ideal for sketching, writing and designing. The box comes packed with a Surface Studio, Surface Pen, Surface Keyboard, Surface Mouse, Power cord with grip-release cable, Quick start guide Safety and warranty guide Booklet.